Simply preheat the oven to 180C/350F/Gas 4. Cut your rhubarb into 7½cm/3in sticks, pop them on an oven tray, sprinkle with water and caster sugar and into the oven with them to roast for ten minutes. Remove when cooked and sprinkle on the ginger, mixing together. 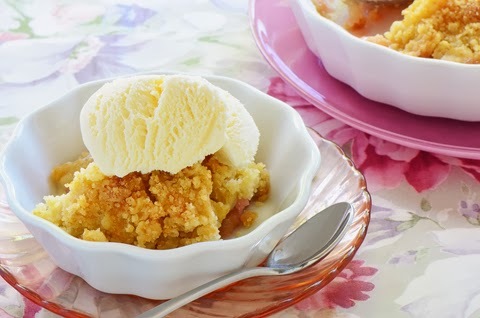 Take an ovenproof dish that’s about 4cm/1½in deep and fill with the rhubarb. In a mixing bowl rub the butter into the flower and sugar for the crumble. When mixed sprinkle over the rhubarb, into the oven for about 35-45 minutes, checking to make sure the topping goes crispy, golden brown. Serve with Jersey double cream, enjoy, then diet for three weeks.